Where are my keys? Put away your shoes! Who left this bag here? What happened to the electricity bill? I need to find my library books! – if these exclamations are a regular part of the day at your house, then maybe you need a family command centre. 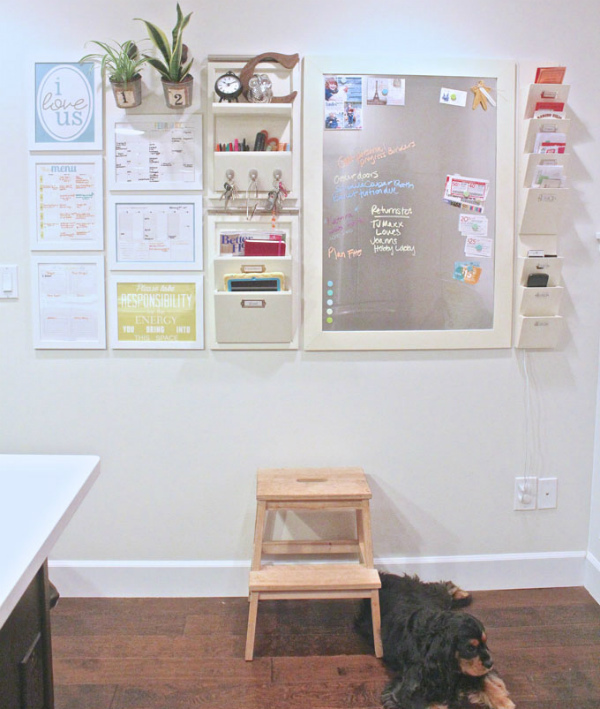 Here’s how to drag yourself out from under the clutter and get started. Permission notes, library books, birthday party invitations, home readers, homework folders, canteen lists, drink bottles, school hats, backpacks – with children comes mess. And also, lots and lots of paperwork, in my experience! In fact, there seems almost no end to the things that the kids are bringing into my house on a daily basis. Sometimes I feel like I’m drowning under the weight of their combined stuff, along with all the regular bits and pieces of household life – shopping lists, mail, bags, calendars. Unless you have trained your family very, very well – chances are that they will dump everything on the first flat surface inside the front door. Don’t worry, you’re not alone. But if looking at the debris of family life strewn from the front door all the way through the house makes you feel overwhelmed, then you need a system. What makes a good family organisation system? It may seem obvious, but there’s no point having a system that nobody uses. 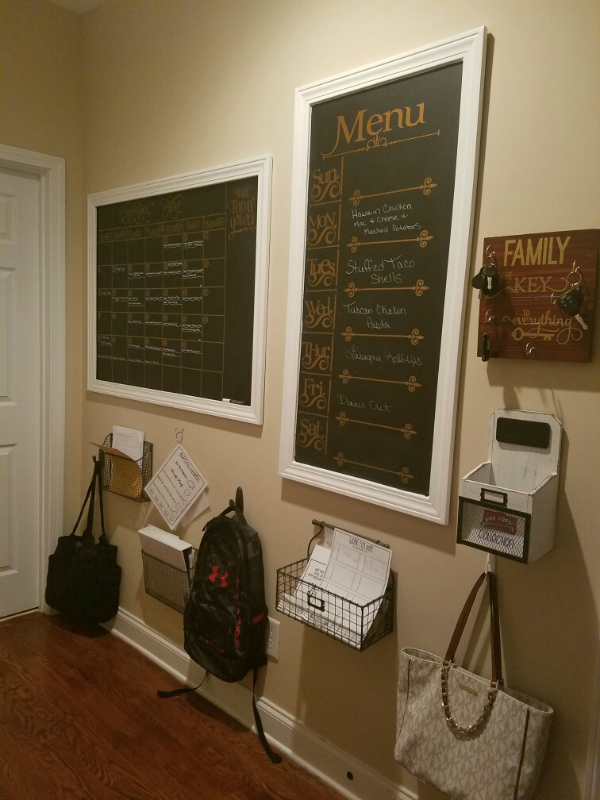 If you have already decreed that everyone needs to take their backpack the whole way across the house to their room and STOP LEAVING IT INSIDE THE FRONT DOOR – but nobody is doing that – then your system isn’t working and needs a shake-up. Pinpoint the natural patterns of movement in your house and work with them. 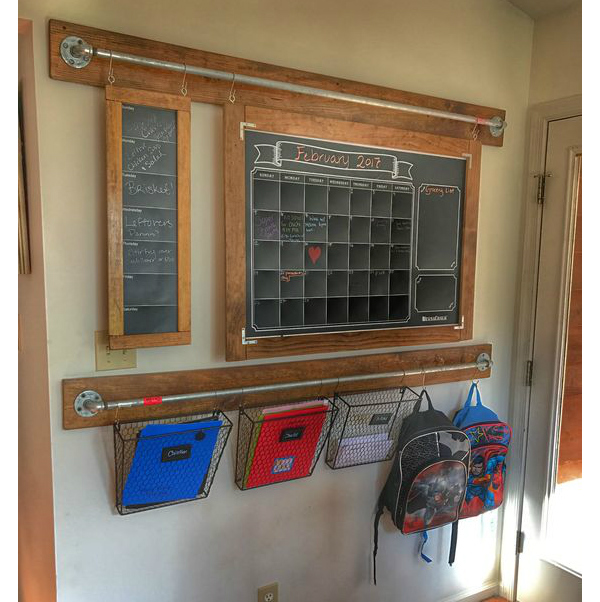 Where are your family already inclined to put things? Why do they put them there? Every family evolves ways of doing things and you’ll have the most success if you work with them rather than against them. 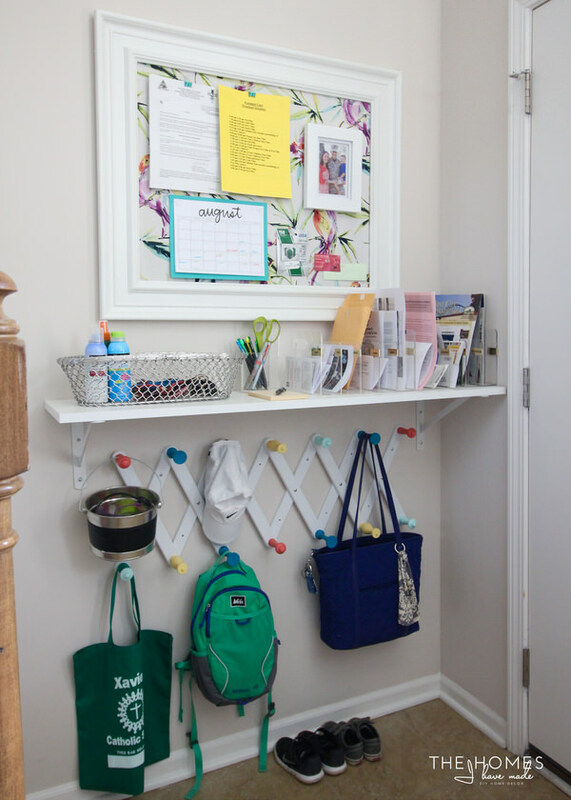 There’s no point expecting a three-year-old to put their bag on a high shelf – but he can hang it from a low hook. If your child can’t read, even the prettiest decal with family chores written on it will not help her get organised every morning. Keep things that you want the kids to use themselves down low! Start small and build on your system as everyone gets used to it. Older children will bring home more permission notes and fewer artworks. Managing extra-curricular activities for a number of children might mean you need a calendar to keep track of who needs to be where and when. Make a list of what the most pressing organisational issues are in your house RIGHT NOW. Perhaps you need a spot for library books and library bags. 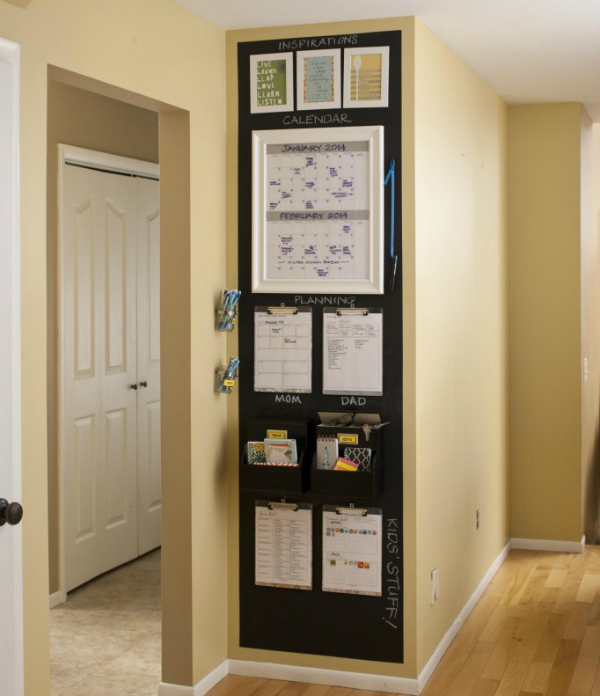 Perhaps you need a pinboard for permission notes and party invitations. Maybe you want all the devices to charge (and be locked away) in the one spot. Start with whatever’s at the top of your list and work your way down. Ask your family for their input, rather than imposing the system on them. Most people (even quite young children) would prefer to know where their things are and not feel the pressure every day of trying to deal with chaos to get out of the house. Their priorities may be different to yours and you might be surprised at what they’d like to include. But they may have great ideas you would never have thought of too. What should your command centre include? How long is a piece of string? The answer will be different for everyone and depend on how many of you there are, how old your kids are, how much space you have and how much money you want to spend on it. Don’t have much cash for a project like this? Don’t worry – you’ll be amazed at the useful things you can find at cheap places like IKEA, Bunnings and Officeworks. Also – shop your house. Go for a wander around the house and find things you could repurpose from their current homes to use in your new command centre. Planning an organisational centre like this can be a bit addictive! Before you fall down the rabbit hole of Pinterest or Etsy and spend your life savings on cute pegs, make sure your system works for your family. 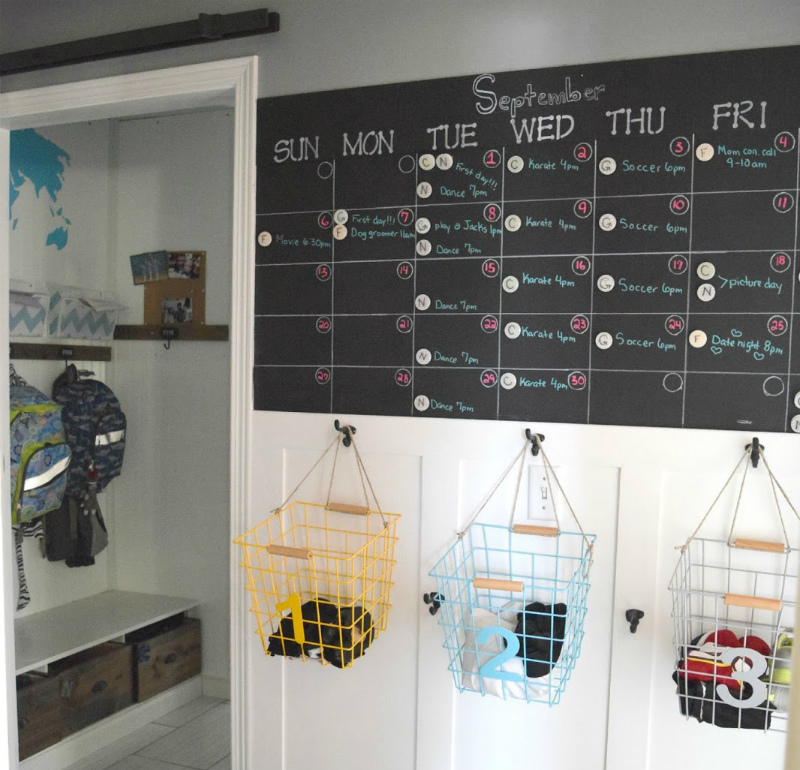 Like any new habit, it will take time for the kids to learn to hang their bag on that hook without being reminded. It will even take time for you (or your partner) to put the mail in the designated spot without thinking. Wait until you know what works and what doesn’t before investing money making it pretty. Otherwise you’ll feel pressure to persevere with a system that doesn’t work because you’ve spent money on it – and you’ll be no better off than you started. Do you already have an organisational system you love? Show us a picture! Why does it work so well?